How to clean your home carpets with optimum ease? Organize the point of entry into your house: Regardless of whether it's the front door, a side door, or even the garage, the point of entry to one's home usually ends up cluttered with shoes and bags. To combat this, use cubbies, seating, baskets, hooks and shelving to organize. If you have the space, consider a mudroom area that can store boots, coats, and allow for seating and space to unload. Kitchen organization will save you time: As mentioned before, an organized space will make daily chores such as cooking less hectic, and even more enjoyable. So if it takes you a long time to cook a simple meal, you might want to do something about your organization. Drawers with utensils and gadgets should be purged, and use drawer organizers to separate large and small items. Give your pantry an overhaul and throw out old food and space clutterers. Clean out the refrigerator/freezer and clear the majority of small appliances off your counters. Organize your entertainment space: During the holidays, the family, living, and multipurpose areas of your home were the venue to host parties. Now it's time to clean out all the old magazines, organize bookshelves, and tidy up entertainment centers with baskets, bins or drawers. You might want to consider using less furniture to open up the space and make it easier to move around. Hobby and recreation areas: Depending on your home, recreation rooms that house a ping pong table or pool table may be in need of organization. Choose furniture pieces, or have millwork built to house supplies, and recreation equipment. For hobby and craft rooms, use drawer storage with rolling casters, and utilize wall space for display. The more creativity you have with your storage, the more enjoyable the space will be to use. Turn Bathrooms into an oasis: Make your bathroom an enviable and enjoyable space by adding usable storage around your sink and counter areas. Opt for vanities that have integral storage and shelving below. Around shower and tub areas, use creative baskets and urns to hold items such as towels and toiletries. Clear the home office to clear the mind: Make a plan for organizing last years, bills, papers, and purge what is not needed. Clear off your desk, and keep only necessities. Make your drawers and closets useful places for storage. Help your kids get organized: Similarly to the other rooms of your home, assess what they have grown out of, what toys can be donated or thrown away. Most kids will not realize many of their items are missing that are under the bed, or lost way back in a closet. Use bookshelves, under bed storage bins, closet organizers and clear bins or open baskets for little hands to put away items easily. Tackle the garage: Rooms meant for storage often gets overlooked and forgotten. Make an assessment of what can go, and what needs to stay. Consider having vertical shelving or ceiling mounted shelving installed to take advantage of hidden storage areas. Use clear bins to label contents, and bring excess storage from inside the house into the garage. And if you can't park even one car in your garage, it a sign that it's time to purge, sell, or donate. 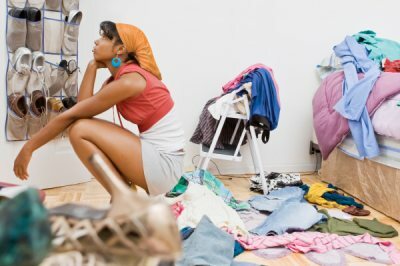 Closets, closets, closets: The problem is similar to garages except that people tend to close the door and forget about the contents. It's time to assess what is not working and make a new plan. Try visiting an organization store to get ideas or seek inspiration online. Look for ideas on how to hang clothes, organize shoes, and stack boxes.